They are interrelated and interdependent and defy solution by partial, sectoral approaches. They are all global in nature and cannot be fully addressed without coordinated actions by the international community. Approaches to resolving these challenges are subject to conflicting claims, priorities and interests. The lack of significant progress on addressing these issues in recent years has raised doubts about the collective capacity of the human community to effectively address them. Each of these global issues is a subject of on-going analysis by leading organizations around the world. Many strategies have been formulated and projected for dealing with one or two of them in isolation, often at the expense of the others. Solutions to ecological problems usually involve economic tradeoffs that neglect the rising aspirations and expectations of developing societies and are also unacceptable to most prosperous nations. Efforts to balance budget deficits and control inflation appear to be in conflict with efforts to stimulate growth and generate sufficient employment opportunities for all job seekers. Investments in security typically neglect the destabilizing impact of rising levels of unemployment on social stability. Managing ever growing global financial resources is undermined by the reluctance of national governments to cede authority to international institutions. There is presently no consensus as to whether real, effective solutions are possible to address the full spectrum of global challenges and what those solutions should be. Is there any way in which the apparently mutually contradictory goals of prosperity, security, sustainability and social justice can all be realized? Today, the global community is broadly conversant with the seriousness of the problems, but it is far from convinced that viable solutions exist for addressing them. The visible absence of political will reflects and results from an absence of mental conviction and social endorsement. Generating mental conviction and social endorsement are the first essential steps toward effective action. The premise for this initiative is that there are in fact viable solutions to fully address all of these apparently conflicting challenges, but that they can only be found by looking beyond the prevailing framework of values, ideas, strategies, policies, and institutions on which current solutions are based. 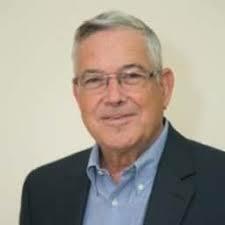 An essential condition for addressing these challenges is to present a comprehensive conceptual framework that sets forth the enabling conditions, governing values and principles, strategies and necessary steps. The World Academy of Art & Science recently launched an initiative bringing together like-minded organizations and individuals to identify the core elements of an integrated perspective, a comprehensive strategy and detailed policy framework capable of addressing these multiple challenges founded on a more fundamental paradigm change. The Geneva conference was the second step in a series and was followed by discussions in Alexandria, Egypt, North America and other locations. One outcome of the conference was a definitive report examining the interrelationships between peace, security, economy, employment, global governance, rule of law, ecology, social process, technology, organization, education, research, culture and individuality and setting forth the elements of a comprehensive, integrated approach to effectively address the multiple challenges posed by their complex interactions. 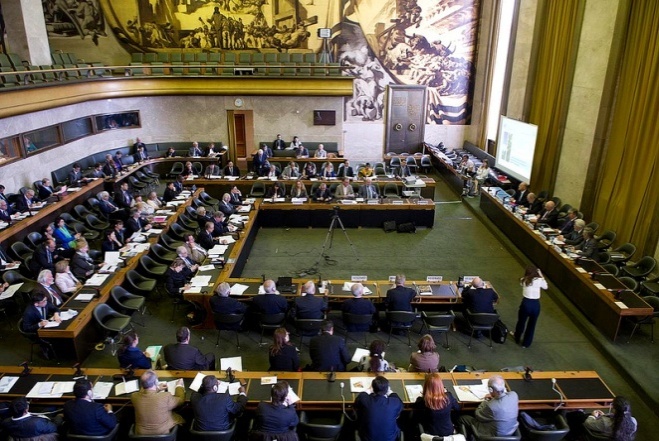 A conference at the Palais des Nations, Geneva will be conducted on June 3, 2013 with participation from major international organizations and NGOs. The objective of the conference was to identify elements of a comprehensive approach for dealing with the major challenges facing humanity today. Issue: Is there a way in which humanity can realize the apparently conflicting goals of prosperity, security, sustainability and social justice? 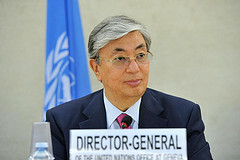 Mr. Kassym-Jomart Tokayev, Director-General, United Nations Office at Geneva: welcome remarks and Keynote address. Theme: Role of trade policy in addressing global challenges. Issue: How can global living standards be raised to middle class levels without depleting or destroying the environment or depriving future generations of the capacity to sustain these achievements ? Luncheon for the speakers and contributors generously offered by the Fondation pour Genève. Issue: How can humanity fully tap the potential of a human-capital and social-capital based strategy for global development ? Issues: How can we evolve a global cooperative security system that permanently eliminates war and the threats posed by WMD ? How can we design and implement system of global governance capable of implementing necessary measures to achieve the other five goals for the welfare and well-being of all ? Theme: The end of war? Mr. David Harland, Executive-Director, Geneva Centre for Humanitarian Dialogue. Issue: On what essential ideas, principles, values, strategies, policies, and institutional mechanisms should the new global paradigm be founded? What steps could be proposed? M. Rong Chen: Geneva Centre for Security Policy. H.E Mr. Petru Dumitriu: Permanent Observer of the Council of Europe. Mr. Jean-Marie Kagabo: ILO, Relacion Extérieurs Département des partenariats et de la coopération au développement"
Mr. Mathias Tüscher: Geneva Center for Security Policy (GCSP). Mr. Ibrahim Jibir Wudil: Geneva Center for Security Policy (GCSP). 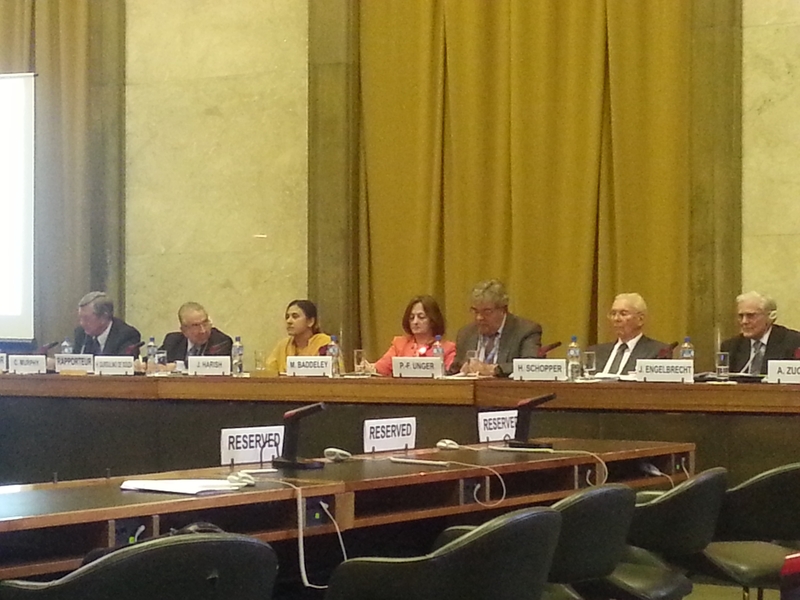 It is a privilege to welcome you all to the Palais des Nations. This time we have come together to discuss acute problems of today’s international situation. Geneva represents an ideal platform for a deeper reflection on where we are headed as the international community and which kind of future we wish to build on. The international conference on Syria, which is taking shape now, is another demonstration of Geneva’s enduring value as a global hub. We appreciate the Host Country represented by Ambassador Alexander Fasel for its consistent support to the United Nations. We also welcome the presence here of State Councillor Pierre-François Unger. Let me also thank the Fondation pour Genève and its President Mr. Ivan Pictet participating in this event, highlighting again the valuable role that the Foundation and the Diplomatic Club, led by Ambassador Luzius Wasescha, play in building bridges across the different communities in Geneva. 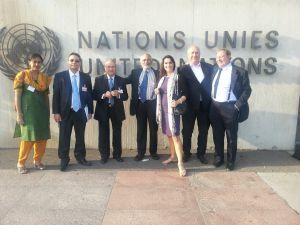 I am grateful to see so many representatives of the entities that make “International Geneva” unique. This conference is intended to take time out of daily technical and policy discussions to pool our experience and know-how to come up with fresh and forward-looking ideas and solutions. I am grateful to our partners in the World Academy of Art and Science – and in particular its President Ivo Šlaus and its Chairman Garry Jacobs – for organizing the event with us. The World Academy has a long and distinguished tradition for cutting-edge thinking that goes across boundaries, leading to creative approaches. I believe that your motto – “Leadership in thought that leads to action” – is very appropriate for our discussions today. The world is undergoing profound changes, and we need both political will and immediate action to react to this transformation. Political, economic and social balances are shifting. New dynamics have come into play, moving centres of gravity – from west to east, and from north to south. As just one example, it is projected that by 2020, the combined output of the three leading South economies – China, India and Brazil – may surpass the aggregate production of the United States, Germany, United Kingdom, France, Italy and Canada. While some of these developments begin to address long-standing global imbalances, they also bring new contradictions and inequalities. 1.1 billion people still live below the internally-accepted poverty line of 1.25 dollars a day. Over 785 million people have no access to clean drinking water and 2.3 billion lack sanitation. The world is more connected than ever before, but still close to 4.5 billion people – predominantly in the developing world – are not online, and 1.5 billion people do not even have electricity. At the same time, we are experiencing increasing division and distrust among communities – both ethnic, religious and national. Despite our increasing interconnections, we in the human family also feel more distant from one another. We witness growth in extremist rhetoric and action based on religious and ethnic hatred. Well-known mechanisms and tools no longer seem adequate to respond effectively to these negative trends. 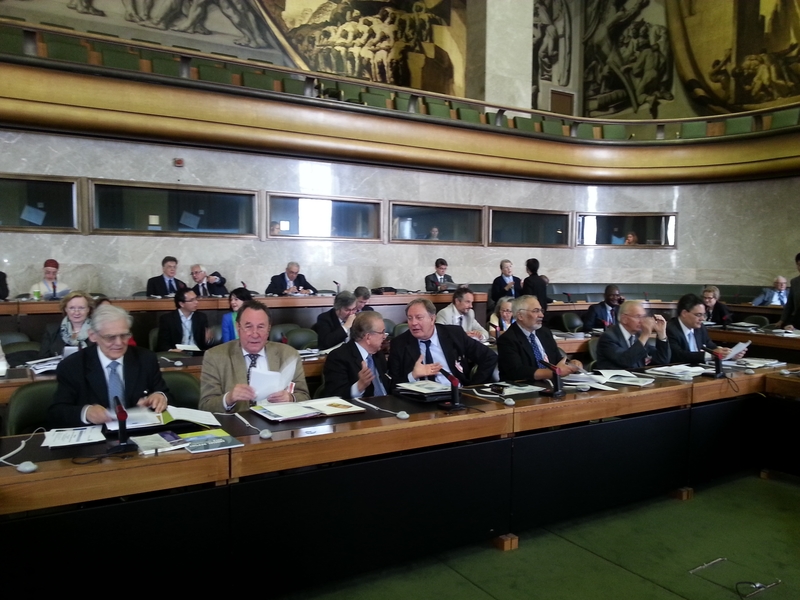 The international conferences are not delivering the results we need: despite years of negotiation, the Doha Round of trade negotiations remains blocked….we have no legally-binding agreement to curb carbon emissions post-Kyoto…and in this very Chamber, the Conference on Disarmament has not been able to agree even a Programme of Work for over 16 years. Against this background, we need to embrace a different type of governance – a new paradigm for how we work together to build a better world. Let me highlight three key components of this governance, which I hope may become issues of our discussions today. First, nurturing partnerships. The challenges we face are interconnected. No single country, no single institution can confront them in isolation. Individually, they have neither the capacity nor the expertise. Let me give you an example: Over 200 million people are without jobs – of these, some 75 million are young people. We cannot hope to create meaningful and sustainable employment without involvement of the private sector. And this is not simply an economic issue, it is a political one. Lack of employment has already led to the undermining of social stability in many regions and countries, to the mistrust of just and efficient governance. Second, reaching across boundaries. We are all aware that the challenges before us touch upon many disciplines. Climate change, for example, has a core scientific component, in analyzing the phenomenon and its consequences, and in proposing solutions. But these solutions have to be agreed and implemented at a political level. Therefore, we still have a long way to go in including different types of knowledge at the policy level, in particular from the scientific, technological and academic communities. As policy-makers, we need to get better at reaching out for the knowledge that we need so that we base decisions on the latest evidence and thinking. I am therefore particularly pleased that we have with us today representatives of these communities. I hope this can become a model to follow, and I welcome therefore the presence today of the Director-General of CERN, Professor Heuer, who is also a strong advocate for such an engagement. Third, embracing different models. No one size fits all. We need to embrace different types of governance models for different issues. The large-scale multilateral negotiations, driven by Governments, still have value. There will be contexts and issues where they are the only way of doing business. But they cannot stand alone. Action through regional organizations. Action through smaller groups of like-minded States. Action led by civil society, or at sub-national level. These are complementary, not competing, models. We have posed as the overarching question for this session: Can humanity realize the apparently conflicting goals of prosperity, security, sustainability and social justice? I believe that the answer is yes. But it will require a new way of doing business, probably with the three elements that I have just outlined at the core and with a strong United Nations bringing these elements together. 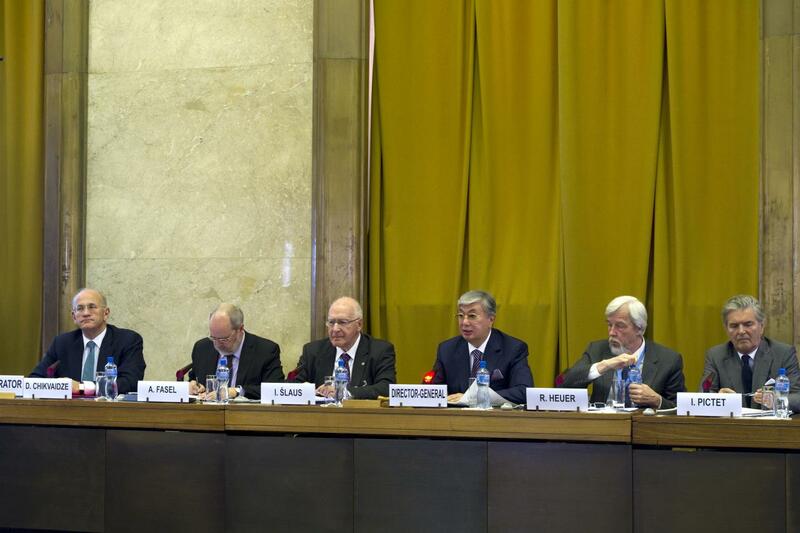 Some observers consider the new governance a threat to the United Nations. I see it as a unique opportunity for it to play a more important role in connecting the different layers and partners for a cohesive and coherent global approach. I am grateful to the outstanding speakers and skilful moderators and rapporteurs who will take part in all our sessions today. It is their input that gives us today a good chance to have an in-depth look at the problems we have to confront. The final session will bring together the different threads of the debates. The aim is a truly inclusive exchange. Thank you very much for your active involvement. The contemporary world is plagued by numerous problems, threatened by e­conomic, ecological, social, political and moral crises. Each of these subjects has been subject to in-depth analysis and endless expert discussion. This is the time to focus on solutions, rather than on further analysis. The lack of significant progress on addressing these issues in recent years has seriously raised doubts about the collective capacity of the human community to effectively address them. Do solutions really exist for the complex multidimensional problems confronting humanity today? Is there any way in which apparently mutually contradictory goals of prosperity, security, sustainability and social justice can all be realized? If so, what is lacking? Do we even know of approximate solutions? Do we at least know "solutions" that are not worse than the present problems? Our record is not very good. In the 20th century many attempts to remedy problems and reduce threats led the world into even greater calamities. We should be guided by the course proposed by Hippocrates: Try to help so as not to inflict damage on a patient. Not to act would be a mortal sin of omission that would lead to destruction, so act we must. This conference co-organized by the United Nations Office in Geneva and the World Academy is a call for solutions – a call for ideas, out-of-the-box ideas. It is a call for a paradigm change. In the past we have made several important paradigm changes, at least in science. Although the physical world, the particles composing it and laws governing it, did not change for the last 14 billion years, our understanding of the physical world has been dramatically altered; first by the Copernican Revolution, then much more through Quantum Physics and the Theory of Relativity, when our concepts of time, space and certainty changed radically. In place of perfect certainty, we have realized that our physical world is based on the uncertainty principle, and that uncertainty still allows quantum electrodynamics to predict with accuracies of one in billions. Our social world is even more complex that the physical. Human beings and society change constantly and the laws governing them evolve over time. We change ourselves and we change the world we live in. It would be vain, even preposterous, to assume that the laws we formulated millennia ago for that different period and very different people are still valid today. Although we resemble in many ways our predecessors from before the Agricultural Revolution, we are in fact very different! Addressing the current problems and threats confronting humanity today requires a fundamental paradigmatic change! It is not enough to merely change the course. We must change the paradigm, but which one? And how? Again, Physics, the simplest of all sciences, can help. We realized that the conception of time has changed, but we preserved the Newtonian laws in domains where they are still valid. The situation in the socio-economic-political domain is much more complex. First, it is a moving target, rapidly moving! So, our first conclusion should be that the new paradigmatic change we look for has to be dynamic, not static! Our second conclusion should be that whatever the new paradigm is, it has to be consistent with the existing paradigms in domains where they remain valid and useful, if there are any. There is one area in which the old paradigm must clearly be abandoned. Although humanity has enjoyed several long intervals of peace, war and violence have been endemic throughout our history. The new paradigm must absolutely call for elimination of violence. No war, no violence – under any circumstances! There is no domain where violence is acceptable! No war, no weapons of any kind, much less weapons of mass destruction or their 21st century successors. Let the incomplete steps initiated by Reagan and Gorbachev in Reykjavik become a reality. Abolish nuclear weapons now! Instead of MAD – Mutually Assured Destruction – let us focus on mutual economic development. The new paradigm may still retain the principle of competition, for competition helps to release human energy, innovation and creativity; but competition is augmented and complemented by cooperation (as biologists from J. Maynard Smith and W. Hamilton argued almost half a century ago). Private property is another feature of the existing paradigm which we cannot dispense with, but private only within limits. Private ownership of the oceans, water, air, would be disastrous. As Mahatma Gandhi said, the world has enough to satisfy everyone's need, but not for everybody's greed. It is essential that we recognize the value of need as supreme. Greed is a threat to those afflicted by it, but also to those advocating it. At a time when income inequalities have increased from the ratio of 5:1 approved by Plato and 20:1 endorsed as the maximum by J.P. Morgan to thousands and thousands to one, it is time to remember that humans are social animals, that the Golden Rule is imbedded in our biology, that we need each other and that human capital is our most precious capital. 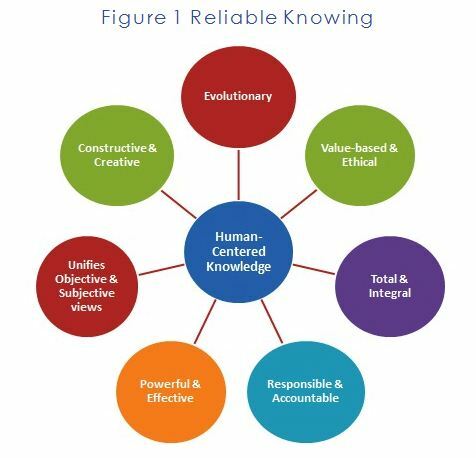 Human capital is the basic foundation stone of the new paradigm. It is the source of all our creativity and innovation and, as Aristotle claimed, it is the main source of our happiness too! The world faces many problems, but they are all interconnected and interdependent. They will not lend themselves to fragmentary, piecemeal solutions. We need to evolve a comprehensive, holistic approach, but one that is at the same time individualized so as to be applied to different conditions. We cannot rely on the model of physical science for our answers, but we can and should apply the same intense creativity and imagination that have enabled physical science to answer the famous Thales' question "How and from what is the world made?" That creativity is our greatest resource for meeting difficult challenges and availing of the expanding opportunities that lie ahead. First of all, I would like to thank all of you for taking part today and sharing your views. I know that we may not have had as much time as we would have liked for discussion, but I hope that you have all taken full advantage of the coffee breaks and other opportunities to talk and to network. It is my hope that new connections have been made here that can lead to further collaboration. One of the recurring themes today has been the importance of translating theory into practice. In many areas, we actually know what the problems are, and we know what to do. The challenge is in implementation, through a systemic approach that allows all interests to be accommodated. New concepts have been put forward. I am sure that ideas such as the “governance cloud” and “the G-0 world”, as well as the correlation between democracy and stability in the world, will continue to generate discussion. We had an interesting discussion on what global leadership is, and how it is being practiced. Many speakers identified the current constraints of short-term electoral cycles and the imperative of immediate results as part of the failure to develop adequate long-term strategies. Another theme that has come up in many is the relationship between politics, science and education. Many speakers highlighted that priorities in these areas have to be based on democracy and human rights. Another overall conclusion is that the future is a resource-constrained world. The competition for water, land and energy will be fierce, and hence will be creating an inherently unstable world, with more conflicts and inequalities. Until now, price and value have been given to traditional sectors of the economy. If we want to beat further environmental degradation and destruction, we need to give proper value to sustainable goods. We need to maximize resource productivity. We need a resource-efficient strategy that goes beyond conventional economic policy frameworks. So, how do we move forward from here? First, we need a vision for sustainable energy in an interconnected world. Second, we need a new logic for economic development that gives priority to science and education. Third, we need economic, financial and political reform that deals with the current short political cycles to enable long-term strategy. And finally, we need a change of the value and pricing system to reflect the current sustainability challenges. As Ambassador Fasel said at the opening this morning, this meeting has increased the quality of the debate at all levels, further enabling us to have an informed dialogue on our interconnected challenges. I thank again the World Academy of Art and Science, as well as the diplomatic community, the international organizations in Geneva and the Swiss Government, for the excellent collaboration that culminated in today’s conference. I wish to take this forward and I hope that all of you will be ready to continue our in-depth reflections on how to build the world that we all want. We have much to be grateful for. In spite of appearances, the world is a far more peaceful place than any time in the last half century. In the past 65 years since the founding of the UNO, the world avoided a third recurrence of world war. Battlefield deaths are at an all-time low. The number of democracies has risen fivefold. The long looming threat of nuclear war has receded since the end of the Cold War, though it is yet to be vanquished. Our more peaceful world is also a more prosperous one. Over the past 200 years world per capita income has risen twelvefold in spite of a sevenfold rise in population – a remarkable achievement in the history of humanity. Yet in spite of these achievements, we are still a world beset with pressing problems and threatening crises – political, financial, economic, social and ecological. What is it that opposes our progress? There are no nations seeking global conquest and empire today. There is no Cold War between opposing military blocs. Our greatest obstacle seems to be the persistent dead weight of old ideas and outmoded ways of thinking that resist change and refuse to disappear. In spite of our remarkable progress, we seem to have run out of creative ideas to effectively cope with the challenges we confront. We are unable to see our way clearly into a better future, because we are blinded by our vision and memories of the past. We cannot see beyond the status quo. Many say what we lack most today is great leadership. They yearn for another FDR, Churchill, Mahatma Gandhi or Gorbachev to lead us from the morass. But what if the very idea that we depend on great individuals for our collective progress is an outdated idea whose time has passed? Throughout history we have seen the creative power of ideas. Ideas can lead even in the absence of great leaders. An influx of creative ideas from Classical Greece spurred the cultural and social revolution of the Renaissance. An influx of new thinking about democracy, socialism, universal education, evolution, relativity and uncertainty spurred the scientific, technological, political, economic, and social revolutions of the 19th and 20th centuries. Today we live in a world where ideas can lead. Ideas have immense power to change the world. As Victor Hugo once wrote, “No one can resist an idea whose time has come”. A new paradigm based on ideas, principles and values appropriate to the 21st century can rapidly transform this world of pressing challenges into one of ever-expanding opportunities. We need new ideas to lead us in the 21st century. We need leadership in thought which will lead to effective action. This is the mission of the World Academy. Of all ideas, values are the most powerful. It has been said that it takes centuries of human experience to make a little recorded history and centuries of history to create a little civilization and centuries of civilization to form a drop of culture. Culture represents the distilled essence of human wisdom acquired over many centuries and the quintessence of culture is universal values which tell us how to live together in peace and harmony, how best to survive, grow, develop and evolve as a species. It was the value of liberty that inspired the great revolutions of the past few centuries. It was the value of equality that ended slavery, empire, and colonialism and still fights on to defeat other forms of social injustice. It is the inherent, intrinsic value of the individual that has unleashed the remarkable creative energy and achievements of the post-War era. Yet for all our progress, we still have far to travel to fully realize these sacred values in our individual and collective lives. A new paradigm must be founded on a reaffirmation and elevation of the values which underpin our civilization, government, institutions, laws, policies and activities. Today, we have heard more than forty thoughtful observers and actors on the international scene share with us their vision of the possibilities and opportunities that await us. They reinforce the view that the individual and global community – the human microcosm and macrocosm – are each infinite in its potential for development. Their messages were positive and full of hope, saturated with the reaffirmation of universal human values that can lead us into a better future. Speaker after speaker affirmed the rights of our common global community as well as the fundamental rights of every individual human being to peace, freedom, right livelihood, economic security and social justice. They stressed the need for value-based economic theory that seeks to promote human welfare and equality rather than growth for growth’s sake. They called for a paradigm shift from competitive to cooperative security, from an inherently unstable system where each nation seeks to enhance its own security by measures that increase the insecurity of others to one in which all cooperate to enhance the security of all at far lower levels of military spending. They argued for expanding the very notion of security from a narrow military-political conception to encompass the economic, social, psychological and ecological dimensions of human security. They reminded us of our collective responsibility to future generations and urged us to act in the interests of all humanity. They reasoned that the social systems we live in have been fashioned by our own minds and hands, not any immutable laws of Nature, and that we have the power to change them if we have the will. They demanded that the rule of law be based on true principles of democracy and founded on the will of the people – of humanity as a whole – not on the power of money or the unlimited, unconditional sovereignty of nation-states. They projected new ideas, evolutionary creative ideas that can build a better future for us all. The discussions today are only one step in a process initiated by the Academy earlier this year in Trieste. It will be carried forward later this week at the Library of Alexandria and subsequently in other meetings around the world. Yet already we can perceive the first sketchy outlines of a paradigm emerging, a paradigm still without a name, yet one founded on basic human rights, fueled by the dynamism of creative human energies, and aspiring to build a world whose principal aim and objective is the welfare and well-being of all human beings. We are living in remarkable times and have been witness to some great creative moments in history. In 1933 the most capitalistic and individualistic of all nations proclaimed its responsibility to ensure the economic security and social welfare of all its citizens. In 1945 the founding of the United Nations marked the end of centuries of incessant warfare on this continent. Two years later Indian Independence signaled the beginning of the end of colonialism. The fall of the Berlin Wall and Iron Curtain in 1989 marked a new stage in global peace and development. It was followed in quick succession by the establishment and rapid expansion of the European Union, an unprecedented experiment in human unity, which has made war in Europe ‘unthinkable’; the founding of the WTO to promote free and fair trade; and the birth of the first truly global social institution – the Internet – the most powerful instrument of individual empowerment and social cohesion ever created, whose full creative potential is yet to be realized. What the world needs now is not another great leader, but another great creative moment – a moment energized by fresh creative ideas, supported by dynamically progressive institutions, and inspired by universal values that express our collective aspiration for a better life and a better world.